The Green Goblin Life-Size Bust is available now! Norman Osborn, aka the Green Goblin, is Spider-Man’s greatest enemy. He was also the first villain to discover Spider-Man’s secret identity — Peter Parker. Norman Osborn is father of Peter’s best friend, Harry. First appearing in The Amazing Spider-Man #14 (1964), the true identity of the Green Goblin was not revealed until issue #39. Also, Peter Parker’s longtime girlfriend, Gwen Stacy, died in a fall resulting from her being kidnapped by the Green Goblin. This happened in The Amazing Spider-Man #121. This life-size bust reveals the terrible visage Osborn has become. The bust is created by artists Gidget Earle, Andy Bergholtz, Jordu Schell as well as The Sideshow Collectibles Design and Development Team. It stands 23.5″ inches high and will scare the socks off of the kids on Halloween. 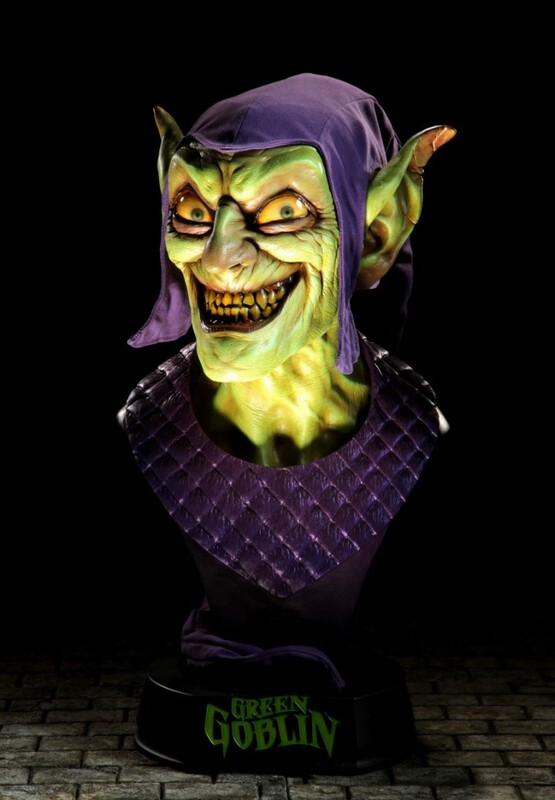 Dodge the pumpkin bombs and order this Green Goblin life-size bust today!